This page provides information about completed and ongoing bikeway projects in the City of Los Angeles. Below are links to Google Spreadsheets outlining details for each type of existing or proposed bikeway. 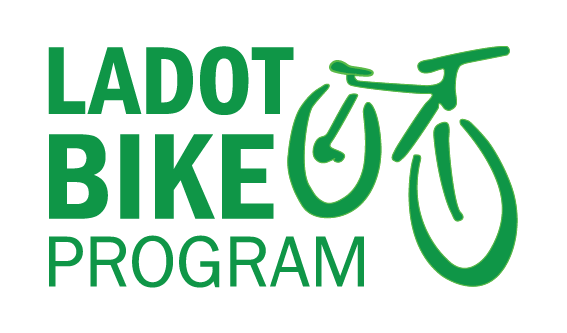 “Bikeway Projects” is a broad term for all the types of bicycle infrastructure LADOT installs–bike paths, bike lanes, bike routes, sharrowed bike routes, and bicycle friendly streets. Click here to view the map of our our projects. Bikeways in Development ** There are separate sheets for Fiscal Year 2014 and “Long-term” projects (slated for completion after FY 2014). Details include: Street, Limits, Length, Status, and Facility Type. 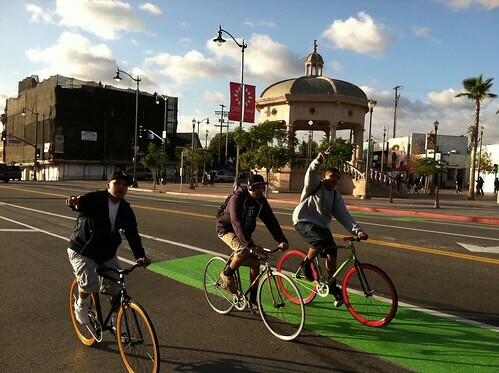 Bicyclists ride along First Street’s green bike lane across Mariachi Plaza in Boyle Heights. *Fiscal years begin July 1st of each year and conclude on June 30th of the following year. For example, FY 11 or FY 2010-2011, began on July 1st, 2010 and concluded on June 30th, 2011. **Bikeways in Development stages: The FY2014 list includes projects in the following stages of design and implementation: “Design Complete”, “In Design”, “Conceptual”, and “Conceptual – AB2245”. “Conceptual – AB2245” refers to Bike lane projects involving reduction of vehicular travel lanes, resulting in a corresponding reduction in capacity which exceeds the City’s adopted thresholds for significant impact; these projects are exempt under CEQA per AB 2245, but also per the AB, require traffic analysis and a public hearing before moving forward. You can read more about AB2245 here; while more information about our prioritization process is available on our Bicycle Plan Implementation Team page. Please note that as each conceptual project moves through the next stage of design, issues may arise that prohibit the project from being constructed, at which point it will be removed from the list. Previous versions of this Bikeway Projects page are archived here. Updated 12/04/2013. When will they extend the Vermont bike path up to Wilshire? Van Nuys Boulevard needs a fully implemented and fully protected cycle track from Glenoaks Boulevard in the north to Ventura Boulevard in the south. While a bike path is probably part of the concept for the Van Nuys Metro corridor, there is no reason why there needn’t be parallel planning for a cycle track. It will put pressure on Metro to make sure a bike path is “baked in” to whatever plans are eventually approved for the corridor. Also Nordhoff’s bike lanes should be extended, and serious consideration given to bike lanes on Roscoe as well. The bike lanes on Chase St. between Van Nuys and Woodman are silly and comical and actually are causing real life bottlenecks…there was no regard given to local feedback from the Neighborhood Council about the bike lanes and what constituents actually wanted. There is also a potential ADA problem with the wiping out of handicapped parking in front of the Panorama City Post Office. To put a bike lane on such a small chunk of Chase, where there is real need for expanding the Nordhoff bike lanes at least to Cal State Northridge if not to Topanga Canyon; and a new and potentially parking-protected set of bike lanes ala MyFig on Roscoe from Laurel Canyon to Topanga Canyon; is the definition of a boondoggle. The Valley needs its fair share of bike infrastructure, but as is often the case, the myopia of Downtown LA politicians and bureaucrats can only see as far as DTLA and the Westside. Please provide bike lanes in the city of Carson. Having a bike lane by 223rd street can connect Long Beach, and Torrance. The city of Carson is outside our jurisdiction as we only operate in the City of Los Angeles. If you wish to communicate with the City of Carson, you may consider exploring the Bikeways or Transportation Services pages on the City’s website. Alternatively, you may consider contacting the Carson Bicycle Coalition for additional information about how and where you can contact Carson city officials regarding your inquiry. Only a brief portion of 223rd St runs through the City of Los Angeles and the street does not appear in our Bicycle Plan. We have, however, striped bike lanes on Carson St from Western Ave to Normandie Ave. These files seem to be a bit out of date. The Mason bike lane between Celtic and Devonshire is complete, for example. Do you guys need help updating them? URGENT PLANNING ITEM! The northernmost access point of the bikeway at Riverside/Victory is a DISASTER that needs to be examined for improvement, and SOON. The bikeway exits/enters to/from a narrow 3 foot wide pedestrian sidewalk which is part of the overpass over the #5. Busy fwy traffic entering and exiting the fwy is a hazard and a nightmare and I simply don’t understand why this isn’t on anybody’s to-do list. WELL, it NEEDS TO BE! Obviously, some major construction needs to occur to mitigate this hazard…engineering studies…perhaps a bicycle bridge, whatever – but somebody needs to get ON this.